Yes, genetics do count, even when it comes to periodontal disease! With a simple test we can now know if our patient will have an over expression of inflammation to the presence of pathogenic bacteria. And with this information we can personalize their treatment and maintenance accordingly. The Perio Sensitivity Test (PST) is a one-time test that determines whether or not an individual is positive for Genotypes IL-1A and IL-1B. In Caucasian populations the prevalence of the PST-positive genotype ranges from 30 to 40%, in some ethnic groups it may be even higher. An individual who is “PST-positive” is at a 3-7 fold increased risk for severe periodontal disease. This genotype predisposes an individual to more severe periodontal disease, which may require more aggressive treatment. It is also important to understand that whenever the PST-positive genotype is present, it is associated with an overproduction of IL-1, a cytokine that amplifies inflammation throughout the entire body, including the blood vessels. This exaggerated inflammatory response also places the patient at greater risk for cardiovascular disease and stroke. Knowing your patient is PST+ can and should influence how we maintain this patient when it comes to disease remission. For example, let’s take a husband and wife scenario. Mr. and Mrs. will have a very similar pathogen report. This should not surprise us since they live and communicate very closely. But what if Mr. is PST+ and Mrs. is not? Although they share a similar pathogen count, Mr. is going to need a much more assertive intervention and maintenance plan due to his over expression of inflammation. He is at much greater risk of chronic inflammation, not only in his mouth, but in his entire body. He simply cannot afford to have ‘bad bugs’ in his pockets. Therefore he may need to be seen every 10 weeks, where Mrs. may be able to maintain disease remission with a 4-month interval. Do genetics count? Absolutely! Remember, about 30% of the patients you treat carry this genetic marker. Understanding the implications of genetics is the next level in personalized periodontal treatment for your patient base. Inspired Hygiene offers a wide-array of coaching services, including implementation of salivary diagnostics/genetic testing. If you are interested in taking it to the next level, please contact us for more information at info@inspiredhygiene.com or 877.237.7230. Special call for DENTAL ASSISTANTS tomorrow! A few months back I had the distinct pleasure of meeting one of the premier dental assistants in the country. With a nudge from Linda Miles (she starts everything 🙂 ), Tina Calloway and I started getting to know each other and I realized how great it would be to do a Mastermind call for all the fabulous DENTAL ASSISTANTS that are members of teams that are IH private coaching and members of our Hygiene Profits Mastermind. 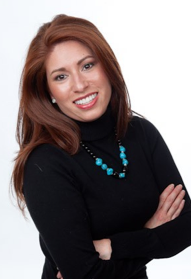 Tina has done hands-on training and lectures for Dental Assistants all across the country at just about every major meeting including Hinman, AACD and Chicago Midwinter to name a few. She’s been blessed with a powerful dentist mentor (I’ll let her reveal who on the call) and this gal has taken every ounce of training and guidance she’s received over the year and RAN with it. As a result, her career has exploded and the best part is…she wants to share with other DAs how they can achieve this too! Here I am with Tina (far right standing) and a great bunch of dental friends. Guess what? The call is tomorrow!! I am inviting you to take advantage of our 2-month free trial offer in our Hygiene Profits Mastermind so you and your dental assisting team can join the call with Tina. You can cancel anytime with no hassle. Go to www.hygienemastermind.com to join so you can get in on the call tomorrow afternoon. And if you can’t make the call, it will be recorded so don’t worry! You’ve had the same experience, I’m sure. A friend or coworker shares with you that a family member is struggling with a major health issue. It happens to me frequently as I tend to meet dozens of new people every week whether in clinical hygiene practice, in a client office or when I’m teaching a live workshop. In the last couple weeks, I’ve had 2 people share that their parent is suffering from kidney failure or heart disease. And so after sharing concern, I ask questions. Here’s EXACTLY how the conversation went recently. I am not making this up! HELLOOOOO…can you say REAL LIFE EXAMPLE? Now I’m not saying the perio caused all these problems. However, it has been well documented that Diabetes and Periodontal Disease have a two-way relationship. If periodontal disease is active it makes it harder to control diabetes and vice versa. There’s also mounting evidence that active perio disease significantly increases a diabetic’s risk for major health events like heart attack and kidney failure. CLICK HERE for a reference article on this connection. 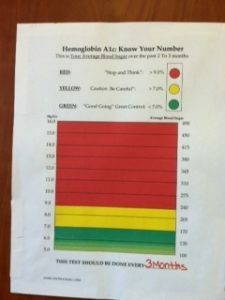 So, here’s the sign that was posted in my doctor’s office. It similar to one I shared with you before. Many of our clients share this with their patients. And don’t forget the #1 question to ask your Diabetic patients…What was your last HbA1c? So if you want PROOF of the oral-systemic link, it’s easy…just ask around!